While some might think that everything that is digital art nowadays is made entirely in Photoshop, the truth of the matter is that the unsung heroes of most masterpieces (besides the artists) are the digital painting apps that don’t even get half of the credit. Designed for illustrators, concept artists, comic book creators, matte painters and even game artists, Krita is one such application that should get a little bit more attention. Put simply, Krita is a powerful digital painting and illustration utility that aims to provide you with as much creative freedom as possible, mainly thanks to its collection of tools. The app’s black-themed user interface falls perfectly into the modern style adopted by most digital editor or designer apps. 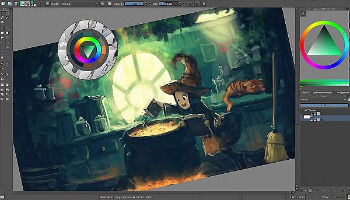 The main window of Krita is extensively packed with almost all the features available within the app. Once you start the tool, you realize that everything tends to be right in your face and, while it may seem a bit intimidating at first, after an adjustment period, things seem quite natural. With Krita, you get CMYK support, HDR painting, perspective grids, painting assistants, dockers and one of the most comprehensive set of brushes available (each with its own patterns, settings and roles). The engines for the brushes include effects like pixelate, smudge, duplicate, filter, hairy, hatching, texture, chalk, color smudge, curve, deform, spray and many others. Another benefit is the fact that you can save the presets of your brushes, as well as experiment with many blending modes. In addition, Krita comes with modern and complex masking and selection tools. With the possibility to select and paint shapes or colors, add transparency and opacity levels, this is a very capable tool if you want to apply non-destructive changes to your illustrations. It is no surprise that an app such as Krita comes with support for both filter masks and layers. You are provided with options to add layers and effects like wave, oil, paint and emboss, as well as adjust their brightness and contrast levels. Last but not least, for an added touch of creativity, the symmetry tools do a lot more than provide you with basic mirroring capabilities. You can determine parameters such as the angles and axes, modify the center position and play with other advanced settings. While at the moment it may not be as popular, as optimized or as good looking as other digital painting apps out there, Krita packs a massive amount of tools and features that make it a very interesting and accessible solution for digital painters and illustrators. One thing is certain, there are a lot of things Krita can do for you, as they are mostly limited by your own skill and talent, not by the app itself.